He says anything that comes to this head as a message from god and practically everybody in the movie laps it up without question. How does one that is not at all virtuous, holy or even ever attended church just decide to set up a church? Asuquo, Udofia’s brother laughs when the suggestion is made to set up their fathers old storeroom as a church. However Udofia reminds him of all the other wealthy men of god that they see parading their riches. The possibility of wealth is alluring and the two brothers start doing missionary work in the village telling the villagers that god has sent them to spread the word and bring them to their church for deliverance. Surprisingly, or rather unsurprisingly their ploy works and the villagers are impressed by their hard sell to the extent that their church grows very quickly with people bringing Udofia money, livestock and other gifts regularly, just as he had planned. Young girls can be very naïve and that is how Udofia preys on their lack of expertise in order to turn them into human cargo. The naivety that existed within the young girls was worrying. Children should be taught from a young age, if something sounds too good to be true then it probably is. It is amazing how one can be shunned, by a whole community and even their own parents solely based on hearsay. How does anyone know that Ekaette is a witch? Is it because her father said so before he died? Is it not possible that he was mad/ coincidence? Not long after her father’s death we see Ekaette go to the market to buy palm oil and not one seller will sell to her. It is ghastly to think that children in real life actually get marginalised like this. Ekaette and Inyang are marginalised to the extent that they are denied an education. Although the headmaster doesn’t want to expel them he has no other choice if he wants to keep the other pupils and his position in the school. I however was overjoyed when principal stood up and told the parent that came to see him about “the witches in the school” that he would not expel Ekatte on the basis of “mere allegation” We can see how easily the ignorant can be exploited. Ailments such as epilepsy are tagged witchcraft. This is pure ignorance. The best thing about the movie was the storyline. The issue of child witches as well as on a much smaller scale, child trafficking were covered. The issue of Child witches is one that is a very important subject matter in my opinion and not told enough. The issues were sensitively handled by Teco Benson. It was a gripping and well told story. Although not fantastic, the performances were solidly good. I was excited to see Grace Amah as I haven’t seen her in anything in a long while, however her character wasn’t fully developed so although she performed well it wasn’t a performance that you would remember in years to come. More character development for Ekaette and Inyang would have definitely improved the movie tremendously. The stand out performance for me was Charles Okafor. He was very convincing as the fake prophet and handled the comedic moments in his role with great skill. The movie is a thumbs up. Go and watch it! 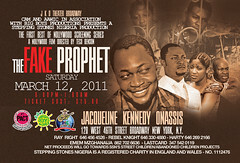 I’m still new to the Nigerian film genre / Nollywood, but based on your review I decided to check this Fake Prophet out. It was better than what I expected. I will stop by again very soon and see what else I should watch…you never know I may soon become a Naija film buff! @stylishmrgordon I am thrilled that I have been able to nurture a Nollywood convert! You are most welcome here! are available for online viewing and instant download.